The government of Mexico City and the Public Space Authority (AEP) launched a new project to renovate public space and improve the quality of urban life in Mexico City. As part of this initiative, a linear park was created on Miguel Aleman Viaduct. 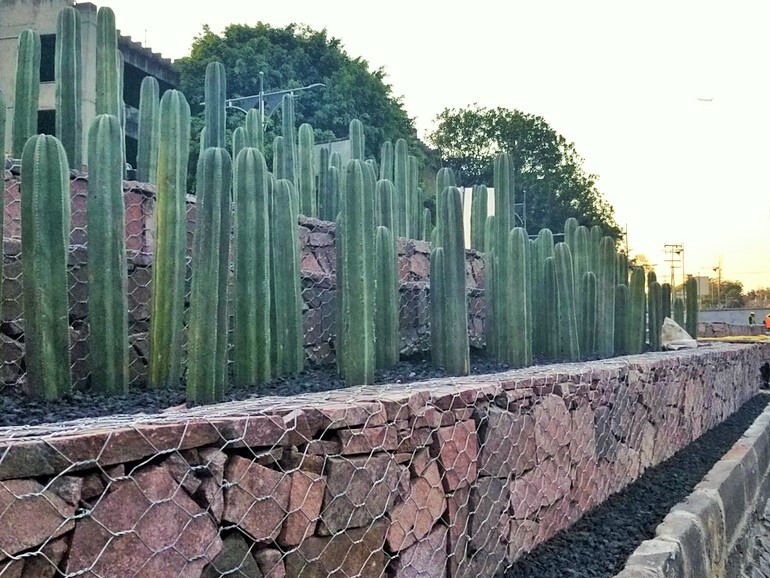 Our gabions were used to build planters and improve the urban landscape. aquatic plant museum, a central cement pavement with planters, benches, electricity and USB connectors. The park is more than a kilometer long and aims to promote natural techniques for water purification and the creation of an independent ecosystem. We participated in the first stage of the project, building special gabion planters on the wastewater drainage channel running under the Miguel Aleman viaduct. Our planters are made from Double Twist wire mesh, filled with tezontle rocks and brown porphyry stones, topped with gravel and cactus plants to give the landscape a more natural appearance. For more information, please download our case history.